"Five (TV channel)" redirects here. For other channels of the same and similar name, see Channel 5 (disambiguation). Channel 5 is a British free-to-air television network. It was launched in 1997, and was the fifth national terrestrial analogue network in the United Kingdom after BBC One, BBC Two, ITV, and Channel 4. It is generally the fifth-placed network in the country in audience share, and has been since its inception. The station was branded as Five between 2002 and 2011, when it was owned by the RTL Group. Richard Desmond purchased the station from RTL on 23 July 2010, announcing plans to invest more money in programming and return to the name Channel 5 with immediate effect, and it was relaunched on 14 February 2011. On 1 May 2014 the channel was acquired by Viacom for £450 million (US$759 million). Channel 5 is a general entertainment channel that shows both internally commissioned programmes such as Fifth Gear, Big Brother & Celebrity Big Brother, The Gadget Show, The Hotel Inspector, Can't Pay? We'll Take It Away! and Gibraltar: Britain in the Sun and foreign programmes. The station has been very successful with imports from the United States in particular, including the CSI franchise, the NCIS franchise, the first 3 series in the Law & Order franchise, Power Rangers, The Mentalist, Body of Proof, Once Upon a Time, Dallas and Under the Dome. In July 2014, Channel 5 announced plans to open up its production arm and allow it to create shows for other channels, following the new policies of the BBC and ITV Studios. Channel 5 Broadcasting Limited was licensed by the UK Government in 1995 after a bidding process that started in 1993 and lasted throughout 1994. The initial round of bidders, which included a network of city-TV stations planned by Thames Television and the Italian politician and media tycoon Silvio Berlusconi (who founded Mediaset, which owns Canale 5 and formerly owned La Cinq, which ceased operations in 1992; he retired his offer a few months later), was rejected outright and the ITC contemplated not awarding the licence at all. The difficulty with the project lay in use of television broadcast frequencies that had been allocated to RF outputs from domestic videocassette recorders. To achieve national coverage, large numbers of domestic video recorders (which output at a nearby frequency) had to be retuned or fitted with a filter, at the bidding company's expense. Wolf Olins and Saatchi & Saatchi were the main companies behind the pre-launch advertising campaign: "Give Me 5". The channel would be both modern and mainstream. 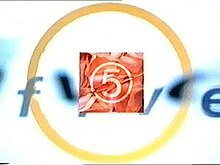 A logo (a numeric "5" within a circle) and visual motif (a "candy stripe" bar of colours, reminiscent of TV test cards) were used, and an attempt was made to establish a collection of Channel 5 faces; through the spring of 1997, billboards of Jack Docherty were displayed, along with other unknown characters. A series of pre-launch screens were displayed on the frequencies Channel 5 would begin broadcasting on in the months before launch as well, including a trailer for the channel and information screens. After re-tuning, around 65% of the population's televisions could view the channel on launch night. The channel's launch on Easter Sunday (30 March) 1997 at 6 pm featured the Spice Girls singing a re-written version of Manfred Mann's hit "5-4-3-2-1" as "1-2-3-4-5". Presenters Tim Vine and Julia Bradbury introduced the nation to the UK's fifth (sixth including S4C) terrestrial channel with half-an-hour of previews. Overall, an estimated 2,490,000 tuned in to see Britain's fifth free network launch, a figure higher than that achieved by launch of Channel 4, fourteen and a half years earlier. “ This campaign set out to achieve three key objectives: to clarify the channel's creative strategy; to refresh the channel's on-screen identity; and to address the gap between the common perceptions of Five and the new reality of our programming – stimulating viewers' reappraisal of Five's programmes and brand. Channel 5 was a name; 'Five' is a brand. 'Five' as a brand reflects the evolution the channel is undergoing in programming and in becoming a more confident and distinctive viewer proposition. On 27 February 2004, it was reported that Five and Channel 4 were discussing a possible merger. Channel 4 and Five announced in November of that year that merger plans were being called off. Early in 2009, rumours started re-surfacing about Five, Channel 4 and ITV conducting a three-way merger. Pearson Television and CLT later merged, becoming RTL Group who became part of Bertelsmann and, control the network, after buying UBM's 35.4% stake for £247.6 million on 20 July 2005. The acquisition was approved on 26 August 2005. After Holleck became involved, he and McGrath brought on board Greg Dyke (later Director-General of the BBC) as interim CEO during the application and launch phase of the project. On 18 November 2005, it was announced that Five had bought a stake in DTT's pay-TV operator, Top Up TV. It was said that the investment may lead to the development of new free and pay services on DTT, and other platforms. 5 STAR launched as Five Life on 15 October 2006, providing dramas, films, soap operas and popular factual and lifestyle shows. The channel previously aired pre-school shows under the Milkshake! banner. It was renamed Fiver in 2008, 5* in 2011 and eventually its current name in 2016. 5 USA launched as Five US on 16 October 2006, offering drama, films, sport, comedy and youth programming from the USA. It was renamed Five USA in 2009 and 5 USA in 2011. Five was taken over by Richard Desmond's publishing group Northern & Shell on 23 July 2010 for £103.5 million. Desmond pledged to top up the broadcaster's total budget to about £1.5bn over the next five years, including new investment of £50m to £100m a year to boost programming and the equivalent of £20m promoting the channel and its shows in a marketing campaign in Northern & Shell publications. The takeover was partly motivated by the opportunities for cross-promotion of Five from Desmond's newspapers (Daily Express and Daily Star) and magazines (including OK!). One commentator warned that "readers will be bombarded with references to Five. The opportunity for cross-promotion between his publications and TV channel are enormous." Upon completing his takeover of Five on 23 July 2010, Richard Desmond remarked; "I prefer Channel 5 to Five, but... we haven't met with the team yet to discuss these sorts of details". The day after, Desmond's Daily Express newspaper noted that the channel's name was to change: "From today the rather vague 'Five' (Five what? Days of the week? Fingers?) reverts to the much more informative Channel 5". On 11 August 2010, Desmond confirmed the restoration of the original name used from 1997–2002. The restoration was revealed onscreen on 14 February 2011. The relaunch also saw investment in a range of new programming with the debut of the (now-cancelled) nightly entertainment show OK! TV. Audience figures for the relaunch were boosted with increased viewing figures for the main 5 News bulletins and improved figures for OK! TV in the 6.30 p.m. slot over its predecessor Live from Studio Five. On 18 August 2011, Channel 5 relaunched Big Brother, starting with Celebrity Big Brother 8 and followed by Big Brother 12, having bought the rights to air the programme following its cancellation by Channel 4 in April 2011. The deal was worth a reported £200 million. The show helped the channel's viewing figures and audience share to rise slightly year-on-year, from 4.4% to 4.5%, in 2012. It was only achieved by Channel 5 and BBC One later in 2012; all other terrestrial broadcasters fell in comparison. In 2013, Ben Frow, the channel's Director of Programming, revealed that the station would be moving away from broadcasting just American imports, by introducing shows from other countries such as Canada, Ireland and Australia to the schedules. The station has since begun screening Australian prison drama Wentworth Prison and Irish gangland series Love/Hate. In January 2014, it was reported that Richard Desmond was looking at selling Channel 5 for up to £700 million. Potential buyers included BT, ITV, Viacom and a joint bid of BSkyB and Discovery Communications. On 1 May 2014, Desmond agreed to sell Channel 5 to Viacom for £450 million (US$759 million). The deal was approved on 10 September 2014 and at the same time it was announced that it was to co-commission programmes with its pay channels such as Nickelodeon and MTV. The channels operate under the Viacom International Media Networks European subsidiary. On 1 August 2015, Channel 5's five advertising regions: London, South/Central England and Wales, Northern England, Scotland, and Northern Ireland were closed with Viacom considering them financially unviable. The closure of the advertising regions allowed Channel 5 HD for Sky HD viewers to swap with the standard-definition version of Channel 5 on the EPG. Under Viacom, the channel planned to increase its original programming output, increasing its budget by 10%. On 11 February 2016, Channel 5 also unveiled an overhauled brand, meant to reflect a new remit of "Spirited TV with an Emotional Heart". The British frequency plan had only allowed for four channels to be transmitted over the whole of the UK using analogue terrestrial transmitters, but the ITC identified that UHF channels 35 and 37 could provide coverage of around 70% of the UK population. These channels were used by many domestic video recorders for RF connection to television sets. Before the channel could launch, the broadcaster had to provide over-the-phone instructions or visit any home that complained to either retune the video recorder or fit a filter to completely block the Channel 5 signal. For many transmitters, channels 35 and 37 were 'out of group', which meant that the roof-top receiving aerials were not designed to cover Channel 5's broadcast channels. Many people either could not receive the channel at all, or required a new aerial. The broadcaster has added to the transmitters to improve the analogue terrestrial coverage since that time. From 23 April 1997, the channel was also provided on the analogue Astra satellite service, which enabled people outside the terrestrial reception areas to receive it via a dish. Unlike the other four analogue British television channels, the channel could not be received via analogue terrestrial broadcasts in many areas, including some parts of the south coast of England where the signal would otherwise interfere with signals from television stations in France; many areas of North East England, especially around the major Tyne & Wear conurbation; many areas in Scotland; most of Wales, most of Northern Ireland and parts of Cumbria. The channel is available on all digital platforms (Freesat, Sky satellite, IPTV and Freeview digital terrestrial, and also most cable operators). On 5 November 2008, the channel launched on digital satellite service Freesat, on the Astra 28.2°E satellites. The channel was the first analogue network in the UK to use a permanent digital on-screen graphic, though this was removed in September 2002. In October 2007, the channel's logo returned to the screen. Channel 5 is available in Switzerland on Swisscom TV and Cablecom. In the Republic of Ireland, unlike the other UK terrestrial channels, Channel 5 is not available on cable or MMDS, the first such service not to be available there. Its terrestrial signal can be received in areas bordering Northern Ireland, or coastal areas close to Wales, and since going free-to-air on 5 November 2008 to join Freesat, it is now available in Republic of Ireland with a digital satellite receiver, but it is not available on the Sky EPG, along with ITV channels. On 30 September 2009, the channel temporarily ceased broadcasting on Freeview from around 9:30 am until midday. This was due to changes to the Freeview platform, which meant moving Channel 5 from a commercial multiplex to a public service broadcasting multiplex to increase the coverage of the channel from around 70% to 99% across the country on relay transmitters which only carried the three PSB multiplexes but did not carry the three commercial multiplexes. Channel 5 HD is a high-definition simulcast of Channel 5. The channel launched on Sky channel 171 and Virgin Media channel 150 on 13 July 2010. In Summer 2015, Channel 5 and Channel 5 HD switched places, with Channel 5 HD now being located in Channel 5's original space of channel 105. Upon the launch, only the Australian soaps Neighbours and Home and Away were shown in HD, with the letters HD placed in the top right hand corner of the screen. Channel 5 HD was due to launch on Freeview during 2010 but was unable to reach 'key criteria' to keep its slot. In 2011 Channel 5 HD was the sole applicant for a fifth high-definition channel slot on Freeview, with the aim of launching in spring or early summer 2012. On 15 December 2011, Channel 5 dropped its bid to take the fifth slot after being unable to resolve "issues of commercial importance". Channel 5 said it "remains committed" to having a HD channel on Freeview in the future. In October 2013, Channel 5 HD became a subscription channel on the Sky satellite platform. Previously, it was available as a free-to-view channel, but is now only available to Sky 'Family Bundle' customers or those with the HD pack. On 27th. April 2016 Channel 5 HD test transmissions started on Freeview Mux. BBCB (CH105). On 4 May 2016, Channel 5 HD became free-to-air, coinciding with its launch on Freeview and Freesat. Channel 5 +1 was launched on Freesat, Freeview and Sky on 6 December 2011. The channel was also expected to be made available via Virgin Media during 2012, eventually launching on 25 October 2012. As with other similar '+1' services, Channel 5 +1 rebroadcasts Channel 5's entire programming output on a one-hour time-delay, though the 'Supercasino' commercial gaming block is blacked out on the timeshift. The launch of Channel 5 +1 meant all three of the UK's commercial PSB services – ITV/STV/UTV, Channel 4 and Channel 5 – now have one-hour timeshifts. My5 was a channel based on the most popular TV shows that are broadcast across all of the Channel 5 network. It was originally launched as Channel 5 +24, a 24-hour timeshift of the main Channel 5 schedule. The channel was launched on 4 February 2014 and was available on Freeview, Freesat, Sky and Virgin Media. The channel replaced 5* +1 on Freesat, Sky and Virgin Media. The channel was originally announced as 5 Later, but changed shortly before launch. 5* +1 returned on Freesat channel 132 on 16 September 2014, and launched on Sky on 4 November 2014, replacing BET +1 there. Until 1 February 2016 two versions of Channel 5 +24 were broadcast: evening primetime content was the same on both, but the version carried to Freeview had continuous teleshopping presentations outside the primetime block, whilst the version carried to satellite and cable viewers interspersed teleshopping 'windows' with a three-hour programming block, broadcast at 10 am, 4 pm and 3 am daily, comprising replays of the previous day's Channel 5 Neighbours and Home & Away episodes and the matinée movie shown on Channel 5 the previous afternoon – this was to get around restrictions that platform operators place on the amount of continuous teleshopping that can be broadcast on entertainment-category channels. On 10 August 2016 Channel 5 +24 was renamed My5. The channel was no longer a 24-hour timeshift of the Channel 5 schedule but showed a selection of programmes from across the network of channels, similar to 4seven. The renaming brought it in line with Channel 5's online on demand service, also called My5. On 16 January 2018, it was announced that My5 would be replaced by a new channel, 5Prime, with the channel showing critically acclaimed premium content and new commissions such as The Secret Life of Owls and The Yorkshire Vet Casebook. However, on 3 January 2018 it was confirmed that the launch would not go ahead until at least early spring, with the broadcaster rethinking the new channel's strategy, look and potentially changing the name. The new channel was launched as 5Select on 13 February 2018. The original Channel 5 logo was a numeric "5" within a circle, sometimes accompanied by "candy stripes" of five colours (an idea based around the colour bars used by vision engineers to monitor picture output). Between 1997 and 2002, Channel 5 was the only UK terrestrial channel to display a digital on-screen graphic (DOG) in the top left-hand corner. On some programmes in the channel's early years, commercial breaks were introduced by an "end of part one" sign emerging horizontally from the DOG; when the programme returns after the break, this would become a "part two" sign, which then disappears back into the DOG. Brand identity is the new holy grail of marketing... Product recognition is the winning move in the new consumer system. Five is being sold like a car or a running shoe. Not surprisingly it will be the first of our terrestrial channels to wear its own label on the outside... "Consumers are very brand-conscious these days..." "...and we are definitely describing ourselves as a very modern channel. It would be curious to launch an old-fashioned channel without an image in the era of Next, Levi's and Nike. In 1999, Channel 5 launched its new 'canopy' idents, making the candy stripe more frequently used in idents and graphics. That also changed in 2000, when the last ident set came in 2002, marking a break from the 'Channel 5' branding. The latter was revived in 2011. In 2002, Channel 5 took the decision to drop the word 'Channel' from its name and refer to the channel as 'five'. A new look launched on 16 September 2002. The informal name "Five" was used in early continuity announcements and idents containing a lower case 'five' had been used on the channel from the launch. On 23 January 2006 a new set of idents was launched, based on four letter words such as Hope, Fast and Love. The idents at first did not feature the logo, but the idents were revised on 2 January 2007 to include the word Five again. On 6 October 2008 at 9 pm, Five aired a new look, replacing the lower-case "five" logo with an upper-case "FIVE". The rebrand was conducted by DixonBaxi, and according to them, the new look was "more vocal, expressive and creative." The look was refreshed in July 2009, making the logo notably larger. As part of the refresh, special idents were made for popular shows such as The Mentalist, Paul Merton in Europe, CSI: Crime Scene Investigation, The Gadget Show and FlashForward. After the takeover by Richard Desmond's Northern & Shell, major changes and considerable financial investment were promised by the new owners, alongside a return to the 'Channel 5' moniker. In October 2010, Desmond revealed the station's new look and confirmed its official on-screen identity as "Channel 5" during a press launch. Desmond promoted these changes in his tabloid newspapers, the Daily Express and Daily Star. There is also cross-promotion between Northern & Shell's newspaper and magazine titles with their websites promoted on the Channel 5 website. In 2010, afternoon movies on Channel 5 were sponsored by the Daily Express. The new logo for Channel 5 replaced the "FIVE" logo on 14 February 2011. The logo is a "5" in a red circle; the extended version of the logo has the word "CHANNEL" in upper case font to its left. The launch DOG revived the "5" motif, originally as a transparent '5' cutout in a bright grey circle. From 18 February 2011, the DOG was modified to a white semi-transparent '5' on a faint grey circle. The DOG was later returned to the transparent '5' cutout in a bright grey circle. On 5 March 2013, the DOG was moved into the 16:9 safe area, along with the rest of their channels. A range of new idents for Channel 5 were launched in February 2011 incorporating the "5" motif featuring live action and CGI elements. They echo the predominantly red colour scheme of the channel's new corporate image, each based in a spacious studio with a large screen as the backdrop for the action. "Drums" features a drummer against a backdrop of animated shapes with the "5" appearing on a screen behind. In "Equaliser", a "5" contained in a cube emerges from a graphic equaliser display. "Imagination" features a battle between a toy dinosaur and robot figure with the "5" logo imposed in neon lights (outlined). "VIP" features a model walking on a red carpet formed from the big screen with the logo formed out of the camera flashes. "Car Chase" features a police car chasing another car which eventually crash 'through' the big screen with the logo being on the side of the police car. A generic ident with the Channel 5 logo pulsating on the studio screen was introduced in April 2012. Several special idents have also been used for The Hotel Inspector, The Walking Dead, Impossible?, Big Brother, The Bachelor, Europa League, The Mentalist, Tamara Ecclestone: Billion $$ Girl, It's All About Amy, How to Take Stunning Pictures, and The Gadget Show: World Tour also based around the same theme of the studio and screen. Programme preview cards feature the font "Gotham" in upper case. Break bumpers featured the "5" logo in the left-hand corner of the screen with a pattern of circles radiating out from the logo in an alternating red and black colour scheme. This logo was retired from use on 10 February 2016; a virtually identical logo would later be used by ABC affiliate WEWS-TV beginning in September of that year, albeit in a blue colour. On 11 February 2016, Channel 5 launched a new logo across all of its properties—a segmented 5 which can be rendered with various designs and animations, alongside a new series of "cinematic" idents, and break bumpers with text messages on them. The new branding was meant to signify a more upmarket and "creative" positioning for the broadcaster; vice-president of marketing Jo Bacon explained that "Our core proposition is Spirited TV, with emotional heart, reflecting the diverse, lively, colourful and creative content that has been the driving force behind our new strategic approach." Critics noted similarities between 5's new logo and that of competing network Channel 4. However, Bacon contrasted Channel 4, explaining that "our content allows millions of normal people access to diverse entertainment with no fuss. We are a playful challenger brand and can appeal to all audiences. The rebrand is a big opportunity to really redefine the DNA of the Channel 5 brand and how it is perceived." 5Star and 5USA also adopted the new logo, while the catch-up service Demand 5 was renamed My5. Below are the official audience shares in percent for Channel 5 since its launch in 1997. Data provided by BARB. The channel consistently is the fifth most watched network in country, usually being beaten by main rivals BBC One, BBC Two, ITV and Channel 4. Audience share rose consistently for the first seven years of broadcast, reaching a peak of 6.6% in 2004. Two years later the audience share had dropped to under 5.0%. In 2012, the audience share rose to 4.5%, the first yearly rise for the channel in audience share since 2009. In July 2013, Channel 5 overtook Channel 4 when taking into account consolidated shares, for the first time. As of September 2013, the channel averages 4.0% of the total audience share. Channel 5, like all the public service broadcasters, broadcasts a wide variety of programmes. The channel mainly broadcasts entertainment programmes, such as reality television, game shows and imported American dramas. The channel broadcasts some sports events not covered by other broadcasters, but is notable for having been for several years the only terrestrial channel to show cricket, in the shape of highlights of England's summer test matches and one-day games. It also broadcasts its own news service, 5 News, which is produced by ITN (but was produced between 2005 and 2012 by Sky News). The channel frequently sticks to a regular schedule, which includes the programme Home and Away at 6 pm followed by 5 News at 6:30 pm. Flagship programmes for the channel include the morning chat show Jeremy Vine (which replaced The Wright Stuff in September 2018), programmes from 3 top US Crime drama franchises (CSI, Law & Order and NCIS) and afternoon Australian soap operas Neighbours (at 1:45 pm) and Home and Away (at 1:15 pm) each weekday. Children's programmes begin at 6 am each day with Milkshake! showing: Thomas and Friends, Peppa Pig, PAW Patrol, Fireman Sam, Bob the Builder, Ben and Holly's Little Kingdom, Shimmer and Shine, Nella the Princess Knight, Little Princess, The Mr. Men Show, Make Way for Noddy, Fifi and the Flowertots, Roary the Racing Car, Bananas in Pyjamas, Roobarb, and many more. In October 2014 Channel 5 announced it had acquired the broadcast rights to NCIS and CSI spin-offs, NCIS: New Orleans and CSI: Cyber. The following is a list of the ten most watched broadcasts on Channel 5 up to 14 February 2016, based on Live +7 data supplied by BARB. From 1997 to 2011 Channel 5 operated its own analogue teletext service providing a basic range of programme listings, film summaries and programme previews of Channel 5 content. The service was provided by Sky Text for several years and later provided by BigStream Interactive in Surrey, UK. The service was withdrawn due to the digital switchover and shift to internet and social media. ^ As of February 2014. ^ a b Abbott, Brendan (24 July 2010). "Channel 5: Great new era for British television". Express.co.uk. ^ a b Sweeney, Mark (11 August 2010). "Richard Desmond rebrands Five as Channel 5". London: The Guardian. ^ a b "Viacom to buy Channel 5 for £450m". BBC News. 1 May 2014. Retrieved 1 May 2014. ^ Conlan, Tara (31 August 2011). "CSI: Miami helps Channel 5 cruise past ITV1". The Guardian. Retrieved 3 January 2014. ^ French, Dan (18 March 2009). "'CSI' hits series high with 4m". Digital Spy. Retrieved 3 January 2014. ^ French, Dan (1 July 2009). "'CSI: Miami' makes record-breaking return". Digital Spy. Retrieved 3 January 2014. ^ Millar, Paul (2 April 2012). "'Once Upon a Time' Channel 5 premiere enchants 2.2m". Digital Spy. Retrieved 3 January 2014. ^ Millar, Paul (27 August 2012). "'Once Upon a Time' jumps to 1.2m in UK for season one finale". Digital Spy. Retrieved 3 January 2014. ^ Lee, Ben (11 January 2012). "Dana Delany's 'Body of Proof' begins with 1.7m on Channel 5". Digital Spy. Retrieved 3 January 2014. ^ White, Peter (31 July 2014). "C5 to free production arm to pitch projects to rivals". Broadcast. Retrieved 31 July 2014. ^ "Berlusconi tenta la carta inglese pronto per l' asta di Channel Five con Mike Bolland tra gli alleati" (in Italian). Corriere della Sera. 28 February 1992. Archived from the original on 9 August 2011. Retrieved 17 June 2009. ^ "Berlusconi fa l' Inglese: nel mirino 'Channel 5'" (in Italian). la Repubblica. 28 February 1992. Retrieved 17 June 2009. ^ "BERLUSCONI rinuncia anche a Channel 5" (in Italian). la Repubblica. 7 May 1992. Retrieved 17 June 2009. ^ "Channel Five Bidding Closes". ITN. Retrieved 11 February 2016. ^ a b "Channel 5 Give me five" (PDF). Wold Olins. Archived from the original (PDF) on 25 September 2007. Retrieved 21 July 2007. ^ "Channel 5 (UK) Pre-Launch Promo ". YouTube. Retrieved 7 January 2011. ^ "Spice Girls launch Channel 5 (UK)". YouTube. 22 November 2008. Retrieved 24 June 2010. ^ "Channel 5". DOG Watch!. Andrew Wiseman's Television Room. Retrieved 11 February 2008. ^ "RTL Group announces strategic relationship between Five and Top Up TV" (Press release). RTL Group. 18 November 2005. Archived from the original on 4 July 2006. Retrieved 4 September 2006. ^ "Five unveils digital TV channels". BBC News. 5 June 2006. Retrieved 12 October 2006. ^ "UK: Media tycoon Desmond seals deal for Five". The Spy Report. Media Spy. 24 July 2010. Archived from the original on 27 July 2010. Retrieved 24 July 2010. ^ Robinson, James (23 July 2010). "Richard Desmond promises Channel Five 'investment, drive and leadership'". The Guardian. London. Retrieved 24 July 2010. ^ "RTL Group sells UK broadcaster Five" (Press release). RTL Group. 23 July 2010. Retrieved 24 July 2010. ^ Sweney, Mark (27 July 2010). "Channel 5 chief reassures staff as experts question strategy". The Guardian. London. ^ "New Five owner Desmond eyes Corrie". Express.co.uk. 23 July 2010. ^ Andrews, Amanda (6 April 2011). "Big Brother to return this year on Channel 5". London: The Telegraph. Retrieved 3 January 2014. ^ Plunkett, John (10 January 2013). "BBC1 and Channel 5 increase their audience share in 2012". The Guardian. Retrieved 3 January 2014. ^ Munn, Patrick (9 May 2013). "LA Screenings: Channel 4 & Channel 5's New Acquisitions Teams Less Bullish On U.S. Content?". TVWise. Retrieved 3 January 2014. ^ Sweney, Mark (2 January 2014). "Richard Desmond appoints Barclays to explore sale of Channel 5". The Guardian. Retrieved 1 May 2014. ^ Williams, Christopher (2 April 2014). "Bids for Channel 5 expected to be less than half £700m asking price". The Telegraph. Retrieved 1 May 2014. ^ Sweney, Mark (10 September 2014). "Viacom and Channel 5 unveil joint commissions as takeover deal closes". The Guardian. Retrieved 14 September 2014. ^ "Channel 5 regions cease". a516digital. Retrieved 4 August 2015. ^ a b "Channel 5 tilts at Channel 4 with 'emotional' post-Richard Desmond rebrand". The Independent. 11 February 2016. Retrieved 11 February 2016. ^ Patrick Goss (5 November 2008). "Five's Freesat arrival confirmed". TechRadar. ^ "Five to Make HD Debut on Sky this Summer". British Sky Broadcasting. 17 March 2010. Archived from the original on 23 March 2010. Retrieved 13 July 2010. ^ "Ofcom hands Five's Freeview HD slot back to BBC". Tech Radar. 15 May 2010. ^ "Channel 5 takes Freeview HD slot". Broadband TV News. 1 November 2011. ^ "Response to Ofcom's Third Invitation to Apply for DTT Multiplex B Capacity" (PDF). Ofcom. 17 October 2011. ^ a b Sweney, Mark (15 December 2011). "Channel 5 again ditches plans to launch HD channel on Freeview". London: The Guardian. ^ "Channel 5+1 to launch on December 6". Digital Spy. 29 November 2011. ^ Sweney, Mark (3 November 2011). "Desmond to launch Channel 5+1". London: The Guardian. ^ Eames, Tom (17 January 2014). "Channel 5 to launch catch-up channel +24". Digital Spy. Retrieved 17 January 2014. ^ Houghton, Rianne (12 December 2017). "Channel 5 is launching new channel 5Prime for "premium content"". Digital Spy. Retrieved 12 December 2017. ^ "Channel 5 Scraps My5, Premium Channel 5Prime To Launch in Its Place - TVWise". TVWise. 12 December 2017. Retrieved 10 January 2018. ^ "Plug pulled on 5Prime launch". a516digital. Retrieved 10 January 2018. ^ Channel 5 is Five Archived 30 September 2008 at the Wayback Machine Dog Watch! ^ Deans, Jason (20 January 2006). "Five gets emotional in onscreen revamp". The Guardian. Retrieved 3 January 2014. ^ "Five: Idents 2006-2008". TV Live. 27 March 2017. Retrieved 14 May 2017. ^ "Channel 5 rebrands as it claims its 'diverse' content doesn't get the credit it deserves". Marketing Week. 9 February 2016. Retrieved 11 February 2016. ^ "Total viewing summary – monthly". BARB. Retrieved 3 January 2014. ^ "BARB: Monthly Total Viewing Summary". Monthly Total Viewing Summary. BARB. Retrieved 22 August 2011. ^ Plunkett, John (10 January 2013). "The Guardian: BBC1 and Channel 5 increase audience share". Annual Total Viewing Summary. London: The Guardian. Retrieved 19 January 2013. ^ "Total viewing summary – monthly". BARB. Retrieved 31 March 2014. ^ "ITN Re-Appointed to produce 5 News". ITN. 8 November 2011. Retrieved 8 November 2011. ^ "Schedule". Channel 5. Retrieved 5 May 2013. ^ "Weekly Top 30 Programmes". Barb.co.uk. 28 October 2012. Retrieved 7 November 2012.